We received a report yesterday of answered prayer from our friends in Ostia. In addition to a number of personal and individual victories, they had a great Sunday. 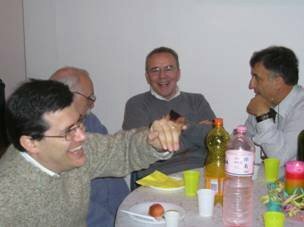 The greatest cause for celebration was "a table overflowing with men!!!" They shared a meal and were thrilled to enjoy the company of several men for whom they have been praying. Please remember to pray for the church in Ostia. I received another recent report of how excited they were to receive Pastor Nathan's last prayer letter. They post them on their bulletin board and pray for us frequently!